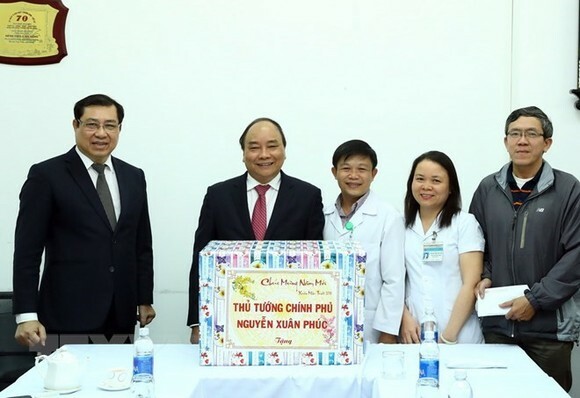 Prime Minister Nguyen Xuan Phuc on February 11 paid a visit to C Hospital, the second largest public hospital in the central city of Da Nang and one of three hospitals dedicated to caring for senior officials in the country. The Government leader lauded the achievements of the medical staff, whose efforts have been highly regarded by people and officials in the Central and Central Highlands regions. PM Phuc asked the doctors and nurses to work hard in the upcoming Tet (Lunar New Year) holiday. He ordered the city’s authorities to work with the Ministry of Health to increase the number of beds for patients from 650 to 700. He noted that aside from infrastructure, hiring qualified medical staff also needs to be a priority. Later in the day, PM Phuc laid a wreath of flowers and paid tribute to war heroes, as well as held talks with veterans and senior officials in Que Son district of the south central province of Quang Nam.